One of my favorite fruits is ripe, juicy nectarines. Sure, they are good for snacking on, but why not get creative and put them in your salad? 1. 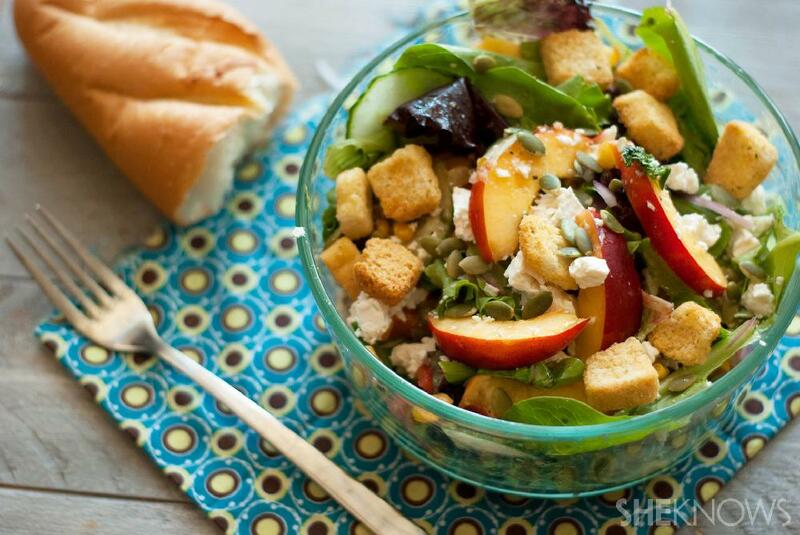 To a large bowl, add the nectarine slices, salad greens, corn, onion, cucumbers and tomatoes. 2. Drizzle the salad dressing over top, and gently toss to evenly coat the ingredients. 3. Divide the salad among 4 salad plates or bowls. 4. Garnish each salad with crumbled feta, pumpkin seeds and croutons, if desired. Tip: For a more filling salad, try adding grilled chicken or grilled shrimp to this dish.